Hedges That Filter Noise And Pollution - Hedging Plant Advice. Many plants can make a valuable contribution towards reducing noise and filtering pollution, especially particulates where the very valuable contribution of hedging is only just being appreciated, browse our list for more information. The best hedging plants to reduce noise and pollution are the evergreen species although leaf retaining Beech and Hornbeam can also be effective. The wider and denser the hedge then the better the effect, improving the quiet enjoyment of your plot far more than any fence! 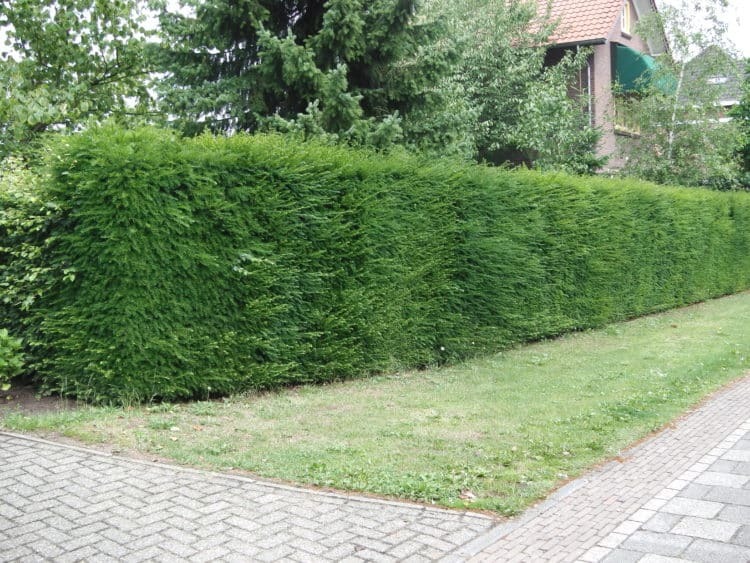 Hedges that filter noise and pollution – Trees and shrubs are very competent at absorbing carbon dioxide and a densely grown hedge will help to combat the effects of pollution from the surrounding air as well as noise from traffic and machinery and neighbour’s gardens. Probably the most well-known plant is the London Plane tree planted in London to combat the effects of pollution from the industrial revolution after the success the French had in planting it in the streets of Paris and it is reckoned that it accounts for over 50% of our city’s tree population. Recommendations are that planting should be as close to the source of the problem as possible rather than the area being protected as this will inevitably be more effective. Evergreen plants with dense growth from the ground upwards will supply all year-round cover better than deciduous varieties, perhaps interspersed with some taller trees dependent upon the size of the problem. If planting to a budget Thuja plicata Atrovirens or Western Red Cedar hedging plants may be an option as it has a very dense habit and very fast growth so smaller plants can be purchased initially. Green Leylandii hedging plants are also a fast-growing species but would need careful management to keep it pruned as a dense structure. English Yew, the most majestic of hedges that filter noise and pollution does a superb job but has a much slower growing habit so if the problem needs containing urgently then larger plants would need to be purchased. Common or Cherry Laurel, Portugal Laurel, Griselinia and the slower growing Holly hedging plants all make good sound barriers even though not quite as tight knit growth as Thuja or Yew. However the larger foliage of some of the varieties is said to provide better noise reduction than smaller leaves and pruning at the appropriate time of year is most important in order to retain the density. To extend the height of the barrier if it is not possible to do so with the hedge then perhaps the planting of deciduous trees interspersed along hedges that filter noise and pollution, such as Poplars, Alders or Aspen which are often used for screening, may be helpful probably more so in spring and summer when the larger leaves of these species are very effective. Should the budget be of no consequence then Instant Hedging Plants of some plant varieties may be purchased, these are grown as a hedge and trimmed whilst growing to provide an established hedge up to 2 metres in height when planted thus giving an instant barrier.